by Michael Adee, a friend and former Executive Director of More Light Presbyterians. Jack Cover served on the MLP National Board of Directors and died on Monday, March 31 at his home in Raleigh, NC. This reflection was read today at his memorial service. Our thoughts and prayers are with his surviving wife, Cam and family. I met Jack through the church as have many people. Jack believed that God’s love was for everyone, no exceptions, no one left out of God’s love and God’s embrace. And, this strongly held belief by Jack became the signature of his life. Jack had learned that some people had been given reason to doubt God’s love for them by the Church, the same Church that had taught Jack of God’s love for him and everyone else. So Jack joined the local chapter of More Light Presbyterians to make sure that LGBT people and their families knew they were part of God’s good creation and loved by God. Jack became a passionate ally in the equality movement in both the Church and society. He was invited to serve on the National Board of More Light Presbyterians. He served faithfully and generously with his big heart on this sleeve. 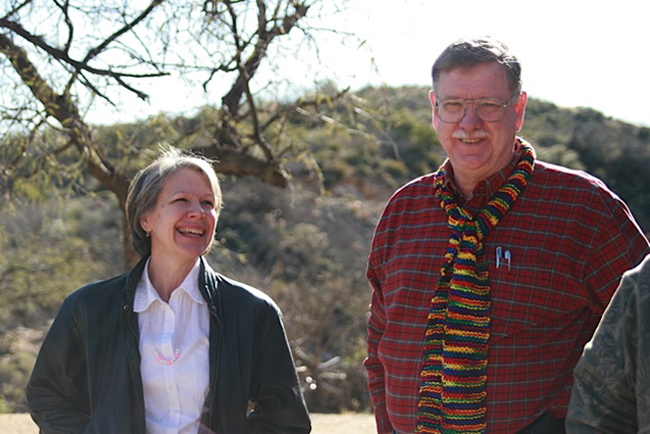 Jack and Cam became beloved and respected members of the national More Light Presbyterian family. They worked at General Assemblies and national conferences. Jack and Cam graciously hosted regional gatherings in their home. 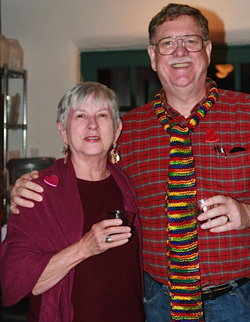 When the call came to Presbyterians to “knit and pray your way” to San Jose for the General Assembly that year, Jack starting knitting rainbow scarves as a witness to God’s love for all persons and he never stopped knitting. He also made the best fudge on the planet and would bring several pans of it to board meetings. To be honest, Presbyterian meetings were much better with Jack’s fudge. When he completed his service on the board, he continued to make the fudge and would ship it to the board meetings. One of my favorite experiences with Jack and Cam was when they showed up for the RainbowCorps’ mission service of rebuilding houses with Presbyterian Disaster Relief in post-Katrina New Orleans. Even though Jack was ill at the time, he rolled up his sleeves and worked every single day with a smile on his face, a song in his heart ,and a good word for everyone. Jack simply did not understand why or how the Church would discriminate against anyone including women and LGBT people. It did not compute with his faith, his experience of God’s love, or what he believed the Church could be. Jack faithfully worked for years to repeal the discriminatory ordination policy in the Presbyterian Church (USA) that was ratified in 2011. Jack was part of changing history in the Presbyterian Church. And, his love and care for all of us changed our lives, too. It was all about love for Jack. He loved his beloved Cam, his family, his local congregation, West Raleigh Presbyterian Church and his More Light family. And, we loved him and we will miss him. Thanks be to God for Jack, his life and his ministry to and among all of us.